Plain packaging has been adopted in 8 countries and is under consideration in at least 15 other jurisdictions, a major increase from less than one year ago. On 1 July, Norway joined Australia, France and the UK as countries that have implemented plain packs. Hungary, Ireland, New Zealand and Slovenia have all set dates for the measure, starting with Ireland on 30 Sep 2017. 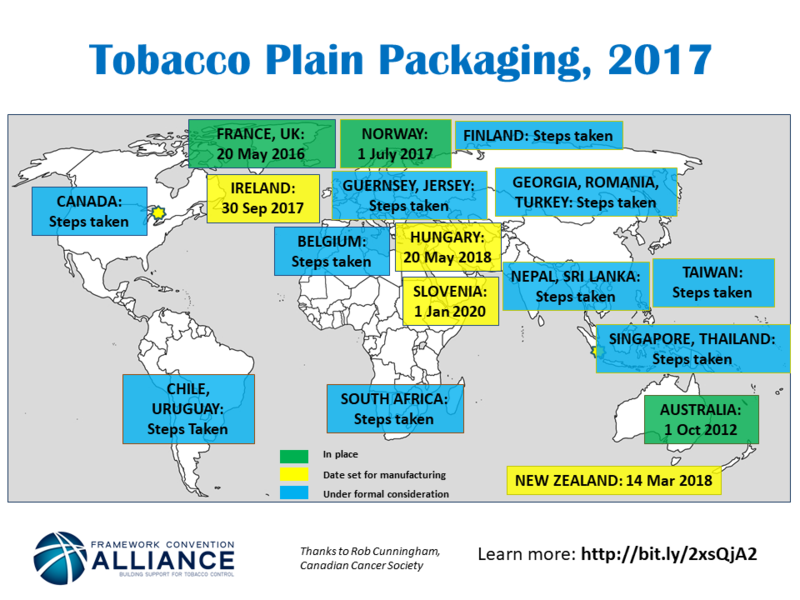 Fifteen other jurisdictions have taken formal steps toward the measure, as shown on FCA’s Tobacco Plain Packaging Map 2017 (see above). Plain packs are free of colours and all other branding, except for the manufacturers’ name written in a uniform plain style. Plain, or standardised, packaging is recommended in the tobacco control treaty, the WHO Framework Convention on Tobacco Control (FCTC). Less than one year ago, just 4 countries had adopted plain packs and 14 others were working on the measures, according to the Canadian Cancer Society. Countries have committed to plain packaging, despite predictable, costly legal challenges from the tobacco industry. The Government of Australia, which adopted plain packaging in 2012, faced multiple lawsuits from Philip Morris, within the country and via an international investment agreement. The industry lost them all. Earlier this year it was reported that the World Trade Organization had rejected a challenge to Australia’s law as an illegal barrier to trade. A final ruling is expected soon. On 19 May 2016 a UK High Court rejected a tobacco industry lawsuit against plain packaging. The judge found that the industry largely “ignores or airily dismisses the worldwide research and literature base which contradicts evidence tendered by the tobacco industry; and, is frequently unverifiable”. Although Hungary’s law requires cigarette makers to use plain packs from 20 May 2018, any new brands put on the market from 20 August 2016 must also sell in plain packaging.